Just as there are certain forms of avant-garde jazz and abstract art that only begin to make sense after 2 AM, having made a serious dent in a bottle of scotch, so does Becky Shaw elude sober theatrical analysis. In an interesting reversal of form, the strange proceedings of this "dark comedy of bad manners" only begin to make sense in the context of its musical interludes from Miles Davis, John Coltrane, McCoy Tyner, Archie Shepp, Don Cherry, and Albert Ayler (designed by Jason Ducat) and the strikingly lit Mondrian-inspired backdrops (designed by Tina Anderson). At first, playwright Gina Gionfriddo's acerbic psychological repartee seems akin to "theatre of ideas" meets the scansion of television sitcom punch lines, causing us to wonder what kind of event could possibly make sense of these interactions. Then, on cue, enters Becky Shaw (Karen Slack), who promptly removes her overcoat to reveal a sequined pink chiffon party dress. As it turns out, the dress is a fitting symbol for the unpredictable thoughts (as per Giofriddo) and quirky behavior (as per Slack) that Becky brings to the party. And what a dysfunctional party it is. 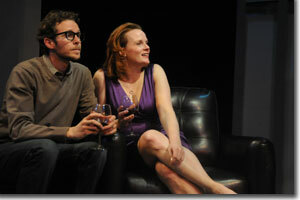 Andrew Porter (John Jurcheck) has convinced his wife, Suzanna Slater (Rachel Fowler), to fix up her step brother, Max Garrett (Bill Hahn), with Becky, hoping that this will somehow lead to a loosening of the emotional bonds between Suzanna and Max, who are, though not blood relatives, emotionally incestuous. We come to discover that Suzanna's mother (Max's stepmother), Susan Slater (Billie McBride), has allowed Max to manipulate Suzanna since childhood. Just as the music presages, Becky's behavior—in the sure, inventive hands of Slack—is a series of events that, while playing credance to the plot (the composition), are improvisational and unpredictable by nature, yet somehow manage to stay within the range of sanity (key signatures and/or modality), as it's defined in the wee hours. What kind of sociopath could possibly relate to such a presence? 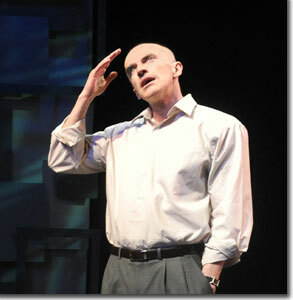 You guessed it—Max, as played by Bill Hahn. It's not that Hahn can't do men who fall within socially acceptable boundaries, he can do this very well, but very few actors can touch him as crazed. So, Max and Becky are a match made in a psychiatric ward. The point being, if the world is going to heal itself, folks like Max and Becky must be able to reach a place of honesty within themselves and with others. In a strange way, only the embittered Susan understands this. McBride effortlessly juggles tough matriarchal authority with motherly instincts, commanding respect from all the kids, leading to unexpected results. If a sense of normalcy—relative to the extremes of Max and Becky—can be claimed in such circumstances, this falls to Andrew and Suzanna, where the import of story's ongoing self-conscious psychoanalysis is brought to bear on their marriage. Fowler and Jurcheck underpin this relationship with a relaxed understanding that, despite their characters' neuroses, gives form to some progressive antidotes for their conflicting motivations. Needless to say, director Chip Walton does a marvelous job sorting through some complicated themes and setting them up in a way that helps us discover the message. 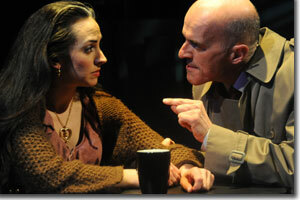 Curious Theatre Company's Becky Shaw runs through April 14th at Curious Theatre. 303-623-0524, curioustheatre.org, or at the Curious Theatre Company box office at 1080 Acoma in Denver.